Practice Area: Putting and chipping greens. Description: Olde Beau Golf & Country Club sits atop a mountain on the eastern edge of the Blue Ridge Mountains at an elevation peak of 3200 feet. 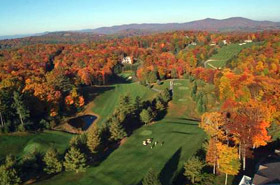 It is a semi-private club offering golf, lodging accommodations, real estate opportunities and banquet facilities just 15 minutes from the Virginia state line and easily accessed from the Blue Ridge Parkway, Highway 21 or I-77 at the Elkin exit. Since its grand opening in the fall of 1991, this course has been named one of the 'Top 50 Development Courses in the Southeast' by GOLFWEEK magazine. PGA Pro Curtis Strange has said that Olde Beau is 'one of the greatest mountain courses ever built.' The original developer, Billy Satterfield, named Olde Beau in honor of his faithful bulldog friend and constant companion. Olde Beau's design, with traditional flat greens and no 'blind shots' to the green, makes more than 1,500 feet in elevation changes over a par 72 layout that measures 6,710 yards from the tips, 6,237 from the middle and 5,652 from the front tees. The greens are regulation bent grass and the fairways and roughs are a rich blend of bluegrass. The course is forever ablaze with hillsides of wild flowers, mountain laurel and rhododendron. To play Olde Beau is to feel the mountain as well. With the emerald green fairways overlooking an ever changing palette of color on the trees, it seems as though you're playing golf on top of the world! Notes: Memberships and stay-and-play packages available. B-Man's Take: This one of a handful of courses on the site I have yet to play. It's on my to-do list, however, as I've gotten more and more great feedback about it. Go play it and post a review! 8/25/14 - Msg Board Posting by panthersfann55 titled "olde beau"